After Nepal's earthquake, on seeing the words on news-scrolls on TV, my daughters asked about tectonic plates. And their father - who never misses a chance like this ;-) - excitedly and enthusiastically explained to them ---- that geologists believe that the Himalayan range, where Nepal is, was actually formed when the Eurasian plate and the Indian plates collided some 275 million years ago. And that 'San Andreas fault' in California is yet another such area - where Pacific Plate and the North American Plate collided - and is therefore prone to earthquakes. Immediately, our second one jumped up, and said, "Oh, that is why there is an earthquake movie coming soon, called, 'San Andreas'"! Well, that's how I heard about the movie, last month. And I watched it with her, last night. Having seen enough Hollywood disaster movies, I can say that, when it comes to showing large scale destruction by computer graphics, realistically, no other sets-and-studios from around the world, can ever match, let alone beat, those of Hollywood! 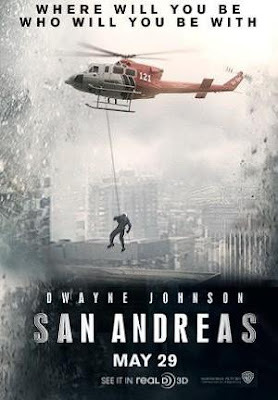 Fantastic, mind-boggling, visuals keep you gripped to this story of a Los Angeles Fire Dept's Search-and-Rescue specialist who struggles to save his wife and daughter from a massive earthquake, that hits along the San Andreas fault line. Unrelated and unconnected to this plot is another; of a seismology professor at Caltech, and his protégé, both trying to predict earthquake occurances. And it is while they collect data in Nevada near Hoover Dam, that, sadly, things get blown up to seismic proportions. Predictable story. Expected fare. It's unbelievable that a LAFD officer, during a huge disaster, gets no calls from his higher-ups but gets calls from his wife and daughter! But an awesome disaster movie, if you wish to see San Francisco and Los Angeles fall apart, in great detail. And if you wish to enjoy the slice-of-life moments - of a family, also falling apart, but struggling to come together, to survive, and, hopefully, to rebuild. I will give it 3 stars out of 5.